This CD contains the Proceedings of the 36th WEDC International Conference, held at Egerton University, Nakuru, Kenya in 2013. The Conference focused on delivering water, sanitation and hygiene services in uncertain environments in low- and middle-income countries. 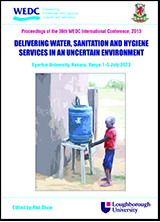 The WEDC International Conference provides a platform for the sharing of ideas, research and experience, and serves to enhance the learning of professionals involved in the water and environmental sanitation sector. The main body of the Proceedings comprises the 120 papers presented at the Conference. Papers are also available free of charge online.